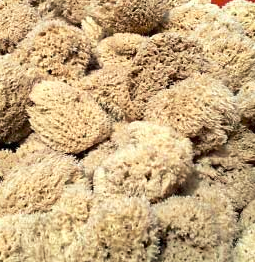 Our Fair Trade wool Sponges Coscinoderma matthewsii, are ecologically grown on organic farms in Micronesia. The sponge farms provide much needed income to the local developing communities. 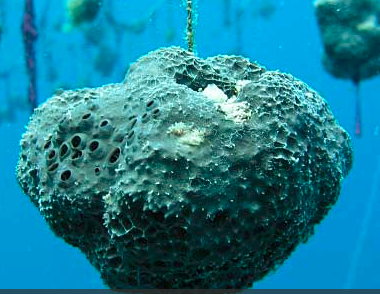 To start a sponge farm or hanging gardens as they are also called, the divers search for good specimens of wild sponges on the sea bed. Only two thirds of the wild "Mother" sponge is cut off with a sharp knife leaving one third of the sponge to regenerate to form a new sponge. 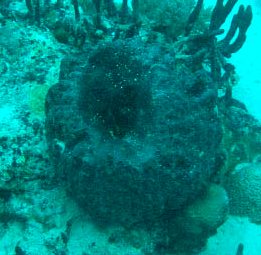 The wild sponges are therefore not depleted and coral reefs are not damaged in the process. It is important to note that although sea sponges are animals, they have no nerves and cutting sponges causes them no pain. 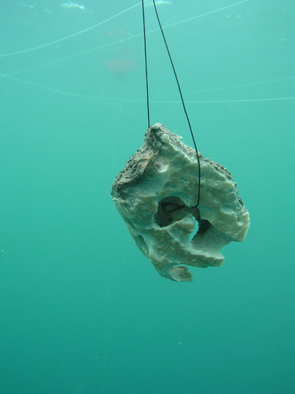 The harvested sponges are then cut into small cubes of approximately 10c m, strung onto nylon rope and attached to a hanging garden or rope farm. A rope farm is normally established in a sheltered lagoon to keep the free hanging seedlings safe from storms and strong currents. The inter-connecting ropes almost resemble a spider web. The farms are marked with buoys for easy location by the farmers and to keep boats away from the area. 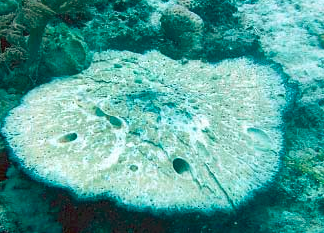 Sponges take approximately two to three years before they are fully grown. Sponge farming is very labour intensive because the farms must be regularly cleaned and "weeded". 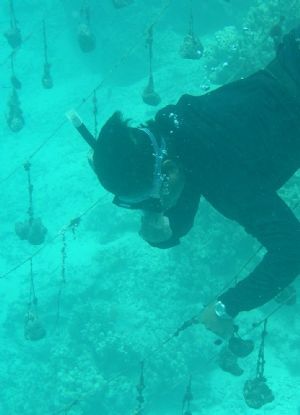 Both the sponges and the ropes must be kept clean of unwanted growth and pests that competes with the sponges for food. 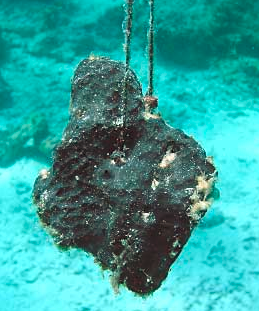 Because some of the new grown sponges are kept aside to be divided up into new seedlings, the collection of wild sponges becomes less important over time. 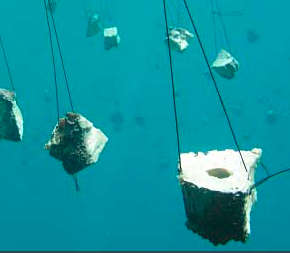 When the fully grown sponges are harvested they The sponges are left in the air to dry for several hours and then placed in baskets or mesh containers and returned to the lagoon for a few weeks during which time all the organic matter are removed naturally by microorganisms. As a final step the sponges are washed with only a little detergent in a normal washing machine or by hand and dried in the sun.